The flu can make anyone really sick, but certain groups of people are more likely to suffer complications and serious illness than others. Among those at highest risk are pregnant women. Pregnant women are more likely to get seriously ill from the flu, which can lead to complications for both the mother-to-be and her unborn child. During pregnancy, a woman's organs shift and the body functions differently in order to accommodate the growing baby inside her. The heart and lungs work harder to provide both mother and child with the blood and oxygen they need. Because her body is working so hard to provide for the life inside her, most pregnant women are more susceptible to getting sick than women who are not pregnant. In addition, if she does get sick, she is more likely to suffer more significant and unpleasant symptoms. The flu is one virus that makes all of us feel miserable. But it can leave a pregnant woman even sicker, hospitalized or even result in death for the mother and/or unborn child. The flu can also lead to preterm labor and delivery for the baby, which can cause any number of other complications, depending on how far along the pregnancy is. Since the flu is so dangerous for pregnant women, what can you do to prevent it? The most effective and important way to prevent the flu during pregnancy is to get the flu shot. It has been proven safe for pregnant women and their unborn children in numerous studies. 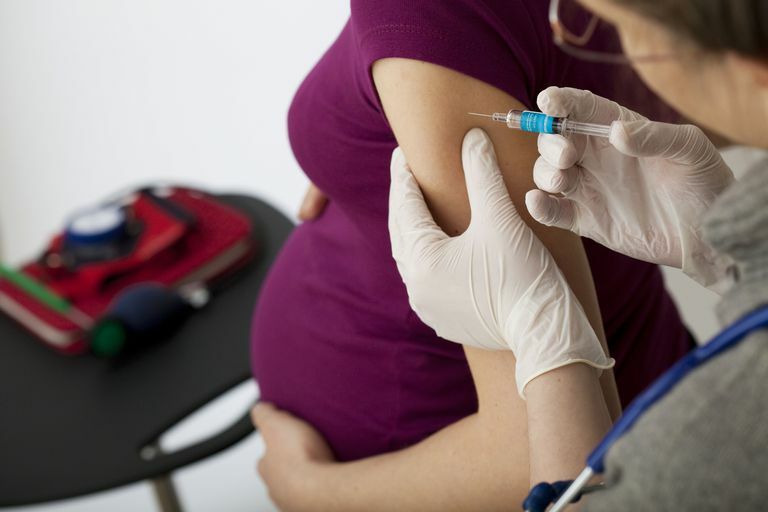 In fact, in a study of over 2 million pregnant women worldwide, the Centers for Disease Control and Prevention (CDC) found the vaccine reduced a pregnant woman’s risk of being hospitalized from flu by an average of 40 percent. The study determined the flu shot offers equal protection throughout all three trimesters. In addition to being critical to prenatal health, the flu shot can even provide protection from the flu for the child for up to six months after birth. This is great news since infants under 6 months old cannot get a flu shot. Pregnant women who wish to be vaccinated must get the flu shot, as the nasal flu vaccine is not approved for use during pregnancy. In addition to the flu shot, pregnant women should take care to avoid contact with people who are sick, especially during flu season. Because of the many changes taking place in her body, a woman who is pregnant will get sick more easily than others. Other tips to prevent the flu, such as washing your hands frequently, using hand sanitizer (when soap and water aren't available) and getting plenty of rest, are especially important for pregnant women. If you are pregnant and get the flu, you will need to know how to take care of yourself. First, call your health care provider as soon as you experience flu symptoms. If you are diagnosed with the flu within 48 hours after your symptoms start, you may be able to take an antiviral medication to help shorten the duration of the illness and minimize the symptoms you experience. Pay close attention to your respiratory system. If you experience any difficulty breathing, seek medical attention right away. If you aren't getting enough oxygen, the baby probably isn't either. If you think you might be wheezing or your chest feels tight, call your doctor or go to the emergency room. Know the signs of an emergency. If you are pregnant and experience any of the following, call 911 or seek emergency medical attention immediately. "Pregnancy Complications." Pregnancy 27 Sep 10. WomensHealth.gov. US Department of Health and Human Services. "Pregnant Women & Influenza (Flu}." Seasonal Influenza 15 Dec 10. Centers for Disease Control and Prevention. "What Pregnant Women Should Know About Flu." Flu.gov. US Department of Health and Human Services. Thompson MG, Kwong JC, Regan AK, et al. Influenza Vaccine Effectiveness in Preventing Influenza-associated Hospitalizations During Pregnancy: A Multi-country Retrospective Test Negative Design Study, 2010-2016. Clin Infect Dis. 2018. 10.1093/cid/ciy737. How Could the Flu Affect You? Should You Go to the Hospital When You Have the Flu? How Long Does a Flu Shot Last? What Does a Flu-like Illness Diagnosis Mean? It's Summer! Could It Really Be the Flu?